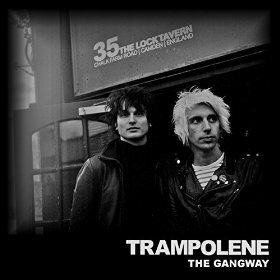 Trampolene's The Gangway EP is subtitled Pocket Album Four and continues their fine tradition of periodically releasing five tracks ahead of recording their debut album. Like its predecessors it's a heady and wild mix of rock and roll that deals both in subtleties and foot to the floor amplification with poetry and an ambitious take on a cover, this time The Cure's Friday I'm In Love, to boot. The title track is, as often the case in Trampolene's songs, a reflective look-back at growing up in South Wales, fighting against the odds to make something of your life, reminiscing that "growing up true is hard to do" and declaring with a large hint of pathos that Jack "can't wait to die, come back as something else, knowing my luck, I'd come back as myself." As it reaches its conclusion, it soars off with huge guitars before dropping down to the sad and desolate conclusion that "it all adds up zero when you're not around." Tom Hardy sees Trampolene in full tongue-cheek mode, a tribute to their actor friend with a load of made up stories that fuel legendary status with claims like "he played bass in The White Stripes before he quit the band, he can play Jimi Hendrix with one hand" and "he took two hundred musicians but didn't trip". Musically, it's the harder side of Trampolene's art, in your face guitar riffs, a massive pounding drum beat and a chorus made for thousands to sing back arms raised, pint in hand. Friday I'm In Love is one of those songs that most bands wouldn't be brave enough to attempt, but Trampolene play it relatively straight, albeit with the guitars and drums turned right up in the mix, and turn it into a playful joyous celebration that even the original can't achieve. Few bands can take genuine classic songs and make them their own without ripping them to pieces but that's just what Trampolene do here. Letting You Down is a beautiful laying bear of the soul, an honest and remorseful piece of self-reflection set to an acoustic guitar opening with "I could hurt if I had the heart". Its power comes from its simplicity, the way each strum of the guitar sounding like another dagger piercing the ribcage further and further as the song continues through its two and a half minutes. The apathetic self-assessment continues throughout with lines such as "I'd cut myself with a bladeless knife" and "I won't be coming around so I won't be letting you down." To Be A Libertine is a poem Jack wrote about his friends in The Libertines, who he's read his poetry with on their big arena tour earlier in the year. Referencing the band's songs and albums and read by Jack alongside some of their fans recorded in what sounds like a gig, it's a tribute to an inspiration and, in Peter, a kindred soul to Jack. The Gangway EP will cement the love and dedication that Trampolene's growing fanbase feel towards them. They're a band that sit and live on the edge of the music scene, that love the buzz of performance and the reaction they get. Like all great bands you have to experience them live to really capture the energy, to understand them, but on these EPs they've already released enough songs to have made up a classic debut album, one of those that might not reach the commercial acclaim it deserves, but one which would be truly loved and held close to the heart by those that have discovered it. This EP is the latest brick in that wall that's becoming quite imposing these days.